Jonathan Davenport (49) battles Tanner English (116) late in Saturday's 50-lapper. What won the race: Using the top side to surge ahead of race-long leader Tanner English in the waning laps, Jonathan Davenport of Blairsville, Ga., won his third Lucas Oil Late Model Dirt Series feature of the week at East Bay Raceway Park. Davenport took the lead for good on lap 45 en route to his seventh career Wrisco Winternationals triumph, worth $12,000. Key notes: One of the longest-running Georgia-Florida Speedweeks tracks, East Bay hosts six straight nights of Lucas Oil Late Model Dirt Series action during the 43rd annual Wrisco Winternationals. ... Hall of Famer Billy Moyer is the all-time winningest East Bay Speedweeks driver. ... The third-mile oval's surface famously changes throughout the night with tides from the nearby Gulf of Mexico thought to affect conditions. On the move: Devin Moran of Dresden, Ohio, started 19th and finished third. Winner's sponsors: Davenport's Lance Landers-owned Longhorn Chassis is powered by a Cornett Racing Engine and sponsored by Nutrien Ag Solutions, ASC Warranty, Spartan Mowers, Mark Martin Automotive, Valvoline, Mega Plumbing of the Carolinas and Midwest Sheet Metal. Points chase: After East Bay Saturday: 1. Jonathan Davenport (960); 2. Tyler Erb (920); 3. Earl Pearson Jr. (895); 4. Scott Bloomquist (810); 5. Devin Moran (780); 6. Josh Richards (735); 7. Tim McCreadie (685); 8. Don O’Neal (670); 9. Jason Jameson (650); 10. Jimmy Owens (640); 11. Hudson O’Neal (625); T12. Justin Williams (610); T12. Billy Moyer Jr. (610); 14. Kyle Bronson (605); 15. Gregg Satterlee (580). GIBSONTON, Fla. — Jonathan Davenport closed out Saturday’s 50-lap Lucas Oil Late Model Dirt Series main event at East Bay Raceway Park in the same fashion he closed out the 43rd annual Wrisco Winternationals — with a flourish. The defending Lucas Oil Series champion from Blairsville, Ga., wasn’t the most consistent during the tour’s six-race stint at the slippery third-mile oval just south of Tampa, but he got better and better as the week wore on. He did the same in Saturday’s finale. Using the top side to surge ahead of race-long leader Tanner English of Benton, Ky., following a lap 32 restart, Davenport out-dueled English in the waning laps to claim his second straight Winternationals victory and third in the last four races. Davenport took the lead for good on lap 45 and went on to win his seventh career Wrisco Winternationals triumph, a victory worth $12,000. As Davenport surged ahead, English faded, dropping all the way to fourth in the final three laps. Tyler Erb of New Waverly, Texas, continued his outstanding Georgia-Florida Speedweeks with a runner-up finish while Devin Moran of Dresden, Ohio, made a late run to grab third from English on the final circuit for his best Speedweeks finish of 2019. English, the polesitter, had to settle for fourth after leading 38 of the first 41 laps and unheralded Justin Williams of Shipman, Va., finished fifth. 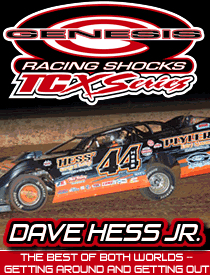 Chasing his first victory since joining Crossville, Tenn.-based Stone-Weaver Racing in the offseason, English darted into the lead on the opening lap. While three cautions slowed his pace in the first 25 laps, it the fateful fourth caution that changed the complexion of the race. English held a commanding 2.631-second advantage over Earl Pearson Jr., of Jacksonville, Fla., when the yellow waved for Chad Stapleton’s slowing car on lap 32. On the restart, Davenport jumped to the outside of Pearson, putting his Lance Landers-owned Longhorn Chassis way to the outside. Catching English, Davenport blew by to lead laps 34 and 35. English battled back to lead laps 36-39 before Davenport shot back to the lead on lap 40. As they raced through heavy traffic, English reclaimed the lead on the next circuit. But when Davenport flashed by to lead lap 45 and a caution appeared for a slowing Pearson on lap 47, English’s fate was sealed. With clear track ahead of him, Davenport easily pulled away to lead the final three laps. “This was a hell of a racetrack tonight, it really was,” Davenport said. “I didn’t even really know where to go there at the end. I knew Tanner was better on the bottom than I was. Then I saw there was a little bit of brown right in the middle where I didn’t have to completely park it in (turns) three and four. With English struggling over the final few laps, Erb, winner of two East Bay features and three Lucas Oil Series races after climbing into the Best Performance Motorsports Rocket XR1 this season, grabbed the runner-up spot. It was his sixth-straight Winternationals podium finish. “I just couldn’t get around Earl (Pearson Jr.) at the beginning on the bottom, so I tried to move up and I could make a little bit of ground in (turns) one and two and I’d lose a bunch in (turns) three and four,” said Erb, who had three seconds and a third to go with his two victories at East Bay. “So I just moved down to try and conserve a little bit. That last caution helped us. We were able to get by Tanner. Moran likely wishes he had a few more East Bay races as well. After a rough start to the week that included only a lone top-10 in the first three events, Moran closed out the Wrisco Winternationals with finishes of fourth, fifth and third. Though he was pleased with Saturday’s podium finish — his first with the Dunn Benson Motorsports team — he said there’s still room for improvement. Notes: Jonathan Davenport became the first driver since Billy Moyer — the undisputed king of East Bay’s Winternationals with 27 career victories — in 2015 to win three Wrisco Winternationals races in the same week. … His margin of victory was 1.426 seconds. … Earlier in the week, Hudson O’Neal joined his father Don O’Neal as an East Bay winner, making the O’Neal duo just the second father-son combo to win a Winternationals race there. The late Jack Boggs and his son Jackie are the other pair. English was attempting to get himself and his father Terry into the exclusive club. Terry won a NARA-sanctioned race (the precursor to the current Lucas Oil Series) at East Bay in 2005. … Devin Moran was hoping he could join his father Donnie as an East Bay winner also. “Bummed we didn’t get that first win at East Bay. I don’t know if I’m ever gonna win here, but we’re at least gonna keep trying,” said Moran. … Davenport said he expects English to have a good season in the Stone-Weaver machine. “That’s a great race car. I drove it many times and they’re gonna get plenty of wins this year with it, so congratulations to him,” said Davenport. … Runner-up Tyler Erb noted how East Bay’s surface kept racers guessing all week. “The track was different once again. Six nights … I don’t think it was the same,” said Erb. … Eighteen of the 26 starters completed all 50 laps. … Scott Bloomquist of Mooresburg, Tenn., was never a factor. He race as high as eighth before finishing 11th. … Josh Richards of Shinnston, W.Va., who has seven Winternationals victories, was shut out of victory lane for the second straight year. … After making extensive repairs to his race car following a crash on Friday night, Vic Hill of Mosheim, Tenn., finished 16th. He had to win the Strawberry Dash to advance to the feature. Row 1: Tanner English, Earl Pearson Jr. Finish (winner transfers): Vic Hill, Tim Dohm, Stormy Scott, Allen Murray, Dan Stone, Rusty Schlenk, Johnny Pursley. Scratched: Devin Dixon, Jonathan Rowan, Colton Horner, Joel Callahan, Devin Gilpin, Geoffrey Carey, Blair Nothdurft, Jeff Mathews. First consolation (top thee transfer): Terry Casey, Devin Moran, Austin Rettig, Gregg Satterlee, Vic Hill, Tim Dohm, Devin Dixon, Jonathan Rowan, Colton Horner, Dan Stone, Joel Callahan, Devin Gilpin. Second consolation (top three transfer): Shanon Buckingham, Austin Hubbard, Kyle Bronson, Johnny Pursley, Stormy Scott, Allen Murray, Rusty Schlenk, Jeff Mathews, Blair Nothdurft, Geoffrey Carey, Hudson O’Neal, Colton Flinner. Polesitter Tyler Erb of New Waverly, Texas, blasted ahead on the opening lap and led the entire 10-lap distance to win the fourth heat. Fifth-starting Don O’Neal emerged from a four-car scrum on the first lap to take the runner-up spot. Mike Benedum, who started second but slipped back to fourth on the opening lap, bounced back to finish third, with Tim McCreadie next. McCreadie turned back an early challenge for the final transfer position from Kyle Bronson, but eventually pulled away to secure the fourth spot. Finish (top four transfer): Tyler Erb, Don O’Neal, Mike Benedum, Tim McCreadie, Austin Hubbard, Kyle Bronson, Johnny Pursley, Stormy Scott, Blair Nothdurft, Geoffrey Carey. Series points leader Earl Pearson Jr. of Jacksonville, Fla., wrestled the lead away from Ryan King on the second lap and went on to win the caution-free third heat. King, who started second, was strong on the outside early before giving way to Pearson. He finished 2.998 seconds behind Pearson in the runner-up spot, barely holding off a closing Matt Cosner at the finish. Chad Stapleton claimed the fourth and final transfer spot after starting eighth. Thursday’s feature winner, Hudson O’Neal, was a distant ninth. Finish (top four transfer): Earl Pearson Jr., Ryan King, Matt Cosner, Chad Stapleton, Shanon Buckingham, Colton Flinner, Allen Murray, Jeff Mathews, Hudson O’Neal, Rusty Schlenk. Making a late charge around race-long leader Scott Bloomquist, Jonathan Davenport of Blairsville, Ga., grabbed the lead entering turn one on the white flag lap and pulled away to win the second heat by .462 seconds. Bloomquist, who started from the pole and led nine laps of the 10-lap feature after darting into the lead at the start, settled for second, while Jason Jameson finished third. Justin Williams continued a strong Winternationals performance with a fourth-place finish. Finish (top four transfer): Jonathan Davenport, Scott Bloomquist, Jason Jameson, Justin Williams, Austin Rettig, Vic Hill, Devin Dixon, Devin Gilpin, Joel Callahan, Joey Moriarty. Winning a drag race down the backstretch on the opening lap, polesitter Tanner English of Benton, Ky., pulled ahead of Jimmy Owens to take an early lead. Owens powered into the lead on the second lap, only to have English reclaim the lead on lao three. English led the rest of the way from there, winning by 1.179 seconds ahead of Owens, who decided to pull out a backup car for Saturday’s action. Billy Moyer Jr., finished third, while Josh Richards rallied ninth to grab the final transfer spot, passing Terry Casey with two laps to go. Finish (top four transfer): Tanner English, Jimmy Owens, Billy Moyer Jr., Josh Richards, Terry Casey, Devin Moran, Gregg Satterlee, Tim Dohm, Dan Stone, Colton Horner, Jonathan Rowan. Earl Pearson Jr. of Jacksonville, Fla., set the overall fast time among 41 entrants for Saturday’s 43rd annual Wrisco Winternationals finale. Pearson, going out in the second group, stopped the clock at 14.689 seconds. He’ll start from the pole of the third heat race. Tanner English of Benton, Ky., with a lap of 14.728 seconds, was the quickest in the first group and will start from the pole of the first heat. Other polesitters: Scott Bloomquist (second heat) and Tyler Erb (fourth heat). Eleven of the 41 qualifiers turned a lap under the 15-second mark. For the first time this week, weather conditions at East Bay Raceway Park are not sunny and warm. Cloudy skies have moved in, temperature has dipped down to about 70 with a steady breeze and even some light rain fell shortly before the 5 p.m. drivers’ meeting. The precipitation was not heavy enough to cause any delay in the start of hot laps, however. … A 41-car field is signed in for the Wrisco Industries Winternationals finale. Devin Gilpin is back on the entry list after sitting out Friday night’s action; drivers who are not competing this evening include Freddie and Tyler Carpenter, Kerry King Sr., Greg Oakes and Morgan Bagley, who broke a motor in Thursday’s hot laps and won’t have a replacement to install until he picks up a fresh Clements piece Sunday at Volusia Speedway Park in Barberville, Fla. World of Outlaws Morton Buildings Late Model Series regular Chase Junghans is bringing Bagley’s powerplant south with him from the weekend’s WoO doubleheader at Screven Motor Speedway in Sylvania, Ga. … Friday night’s 50-lap feature included the strange sight of Clint Bowyer Racing teammates Don O’Neal and Josh Richards slowing on lap 36 because their cars became hooked together after O’Neal unexpectedly slid up the track in turn one in front of Richards. They shook free, but a caution flag was displayed for Richards — his strong charge from 12th to fifth was ended by nosepiece damage from the contact — while O’Neal, who ran as high as third, experienced ignition woes and headed pitside on lap 37. … Tanner English ran as high as fourth in Friday night’s A-main before developing a wicked vibration in his Stone-Weaver Racing No. 116 that ultimately developed into a race-ending broken rearend on lap 45. … Moments after Lucas Oil Series rookie candidate Stormy Scott broke into sixth place in Friday’s feature, a bent guide rod in his car’s rack left him unable to steer. He brought out a caution flag on lap 47 and was towed off the track. … Colton Flinner won his second heat race of the week — and his Lucas Oil Series career — on Friday night but was an early retiree from the feature after contact with Richards caused him to pull up lame on lap six sporting left-side damage and a broken front shock. 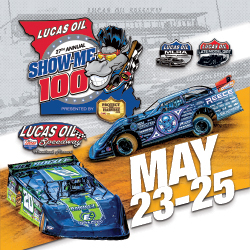 … Dunn Benson Motorsports team owner Kemp Lamm is in attendance for Saturday’s program accompanied by several family members, including his mother Becky, who is making her first racetrack appearance since the passing last spring of her husband and team founder Carlton Lamm. The Lamms have a time share in Kissimmee, Fla., and their stay dates allowed them to visit East Bay. East Bay Raceway Park is set to host the sixth and final race of the 43rd annual Wrisco Winternationals. Through five events, Tyler Erb of New Waverly, Texas, and Jonathan Davenport of Blairsville, Ga., have two wins apiece, while Hudson O’Neal of Martinsville, Ind., has one victory. Erb, who has been the most consistent driver thus far with two runner-up finishes and a third to go along with his two victories, has been shut out of victory lane since winning on Monday and Tuesday. He and Davenport, who has won two of the last three, will attempt to become the first driver to win three of East Bay’s Winternationals features since Batesville, Ark., Hall of Famer Billy Moyer captured three wins in 2015. Davenport’s won on Friday, which paid $12,000, was the first Lucas Oil Late Model Dirt Series point-paying event of the week. Saturday’s 50-lapper, which also pays $12,000 to win, is a points race as well. The field will be split in half for time trials followed by four heat races (four apiece transferring), two consolation races (three apiece transferring), the Berry Barn Strawberry Dash presented by DirtonDirt.com and the $12,000-to-win, 50-lap main event.